Once a week, my family and I like to have a family night and go a little crazy with stuffing ourselves with some wholesome and simple desserts made with real ingredients. Nothing with artificial flavorings, additives, chemicals, or anything of the sort. We are also a family of pudding freaks! We love it, especially during the Summer time. We love KozyShack® pudding because of their pure & simple ingredients, and they’re amazing to enjoy any time of the day! KozyShack® made our most recent dessert family night a HUGE hit! KozyShack® comes in two convenient sizes: snack packs and a slightly bigger tub that 3 to 4 people can easily enjoy. However, as you know, I like being creative. Yes, you can easily add a 1,001 delicious types of toppings: Salted caramel sauce, mini chocolate chips, whipped cream, and the list of culinary creative toppings goes on and on. I completely trust and love the KozyShack® brand of Tapioca pudding. As soon as you open the lid, your sense will be filled with that amazing vanilla smell that is associated with it. The nostalgic smell instantly takes me back to a time when my mom used to stand over the stove and make tapioca pudding for us from scratch! 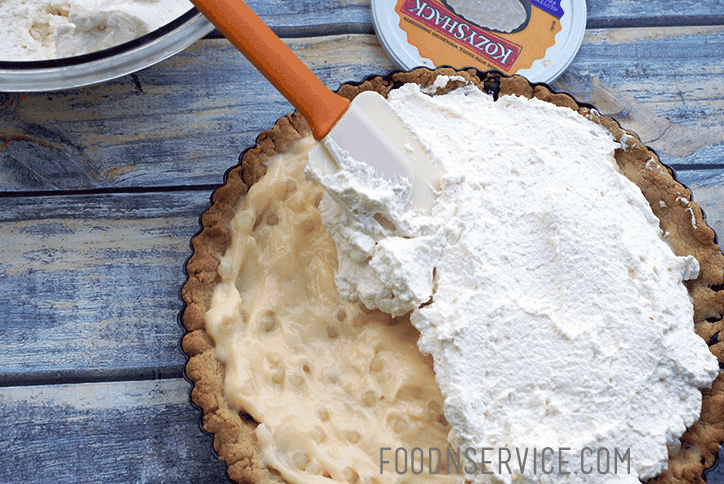 I decided to turn my KozyShack® Tapioca pudding into a filling for my amazing chocolate chip cookie pie crust. I finished it with homemade whipped cream and chocolate shavings. Oh yeah. It was absolutely amazing, and we finished it one sitting. Don’t judge us. We love food, especially when pudding and chocolate chip cookies are involved! You definitely need to make your next family night, a KozyShack® Tapioca Pudding night! Now for my simple and amazingly delicious recipe! I hope you enjoy it as much as my family did. In a large bowl, cream together: granulated sugar, brown sugar, vanilla extract, and butter. Make it nice and cream. Use a mixer on low to medium speed for about 5 minutes. Once creamed, add in your egg, salt, and baking soda. Mix on low until well blended. Slowly add in your flour a 1/2 cup at a time until the dough becomes too stiff, and then mix with your hand. Add your chocolate chips to your dough, and mix with your hands. The dough will be too stiff to mix with a spoon. Using a non stick spray, spray down a 9" tart pan. Place dough into pan and mash down to form the crust by hand. Bake for approximately 20 minutes and allow to cool. Add a nice layer of your Tapioca pudding. Top off with a nice thick layer of whipped cream and some chocolate shavings! With your homemade whipped cream (or store bought, if you wish). Here’s the visual tutorial, if you’re like me and need pictures! Cream initial ingredients and then add egg, salt, and baking soda. Cream together lightly. Then add in remaining flour. Form crust with your hand. Add in KozyShack® tapioca pudding, and top with whipped cream. Add chocolate shavings and then eat it up!